The fast pace of soaring popularity of implants in dentistry by clinicians and patients alike is substantiated by the existence of a booming share of implants in the global dental market, i.e., worth approximately US$7 billion with a perceived annual growth rate of 9%. This existent profitability of implants is incumbent on high success rates of approximately 95% for placing prosthesis in completely as well as partially edentulous jaws. However, the local conditions may not always be favorable for implant placement as in cases of deficient bone volume after extraction. The sufficient horizontal as well as vertical bone dimensions are a prerequisite to warranty the success of implants., But the fact that the maintenance of the alveolar bone is dependent on the presence of teeth explains the high prevalence of paucity of sufficient bone after extraction., Hence, often there is the need to augment the available atrophic bone to make it amenable to implant placement in suitable prosthetic positions with desirable stability and aesthetics. To feed this need for augmentation, a plethora of agents and techniques are available with volumes of literature; yet there is an absence of consensus for the efficacy of any of these surgical techniques.,, The present paper will attempt to summarize the evidence on changes in the alveolar bone after extraction, efficacy of ridge augmentation, comparative efficacy of various techniques and graft materials, and short implants versus ridge augmentation. Further, this paper will give a descriptive insight into various bone graft materials, techniques, and physiologies of regeneration. Also, an algorithm to guide the selection of suitable techniques and materials in commonly presented clinical conditions would be presented. 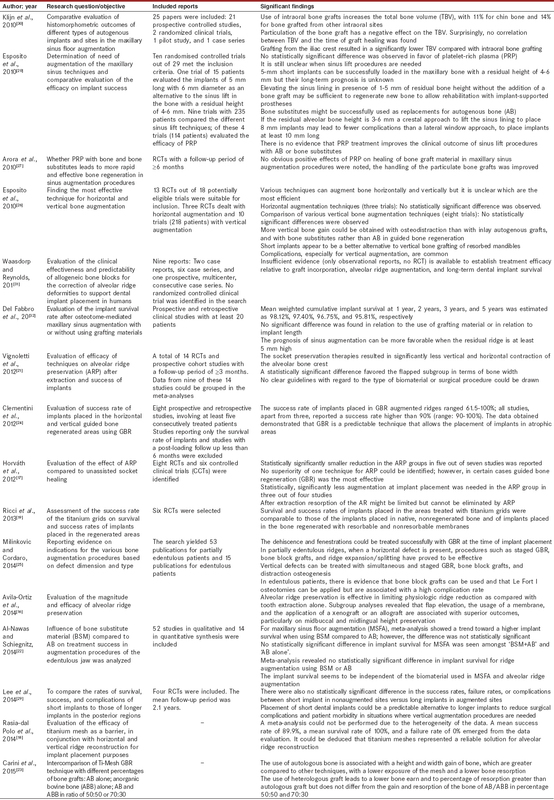 The data presented in this section is an overview of the recently published systematic reviews and meta-analyses investigating the outcomes of various techniques as well as materials for ridge/socket augmentation [Table 1]. Although definitive outcomes for clinical guidance could not be extracted from the published literature primarily owing to heterogeneity, a few conclusions yet noteworthy. The heterogeneity existed mainly owing to variable research methods (randomized controlled trials, case series, and/or retrospective records), heterogeneous outcomes of interest as well as poorly defined outcomes and short follow-up periods, etc. It can be safely concluded that ridge/socket augmentation is an efficient procedure for augmenting atrophic/deficient bone. Statistically significant alveolar volume gains in preserved/augmented versus nonpreserved sites have been reported, i.e., +1.89 mm in terms of buccolingual width, +2.07 mm for midbuccal height, +1.18 mm for midlingual height, +0.48 mm for mesial height, and +0.24 mm for distal height  Even greater alveolar bone volume gain has been reported with use of Ti-mesh as barrier in combination with autogenous/allogenic/xenogenic bone grafts, i.e., ≈4.91 mm of vertical regeneration and ≈4.36 mm of horizontal regeneration. On the other hand, it is quite interesting as well as contrasting to note that similar rates of implant success and survival have been reported for implant placement in augmented versus naive bone. This seriously questions the rationale of ridge augmentation. Also, the existing literature points toward the need for simultaneous augmentation at the time of implant placement., So, instead of routine use, socket grafting procedures should be performed when there is a possibility of extended treatment time between extraction and implant placement. Also, it has been recommended that socket grafting should be performed in aesthetic areas in case of buccal bone thickness≤2 mm or when there is a proximity to anatomic structures, i.e., maxillary sinus or mandibular canal. There are three basic mechanisms , by which bone grafts augment recipient bone site, i.e., osteogenesis, osteoinduction, and osteoconduction. In osteogenesis, surviving residual cells in the bone graft differentiate into osteoblasts and stimulate the formation of new bone. Osteoinduction is a process where the bone graft stimulates the formation of new bone by virtue of bone growth factors contained in it. In osteoconduction, the bone graft possesses neither the ability to regenerate bone nor stimulate the recipient bone to form new bone. Here, the donor graft merely acts as a scaffold for ingrowth of vascular and connective tissues. Eventually, all transplanted grafts are replaced by new bone. On the basis of origin, there are mainly four categories of bone grafts: autografts, allografts, xenografts, and alloplastic materials. All of these possess distinct as well as overlapping advantages and disadvantages [Table 2]. These refer to grafts transplanted from one place to other within the same individual. These are referred to as the “gold standard” owing to the only graft types with all three mechanisms of bone regeneration, i.e., osteogenesis, osteoconduction, and osteoinduction as well.,,, These can be harvested from neighboring intraoral sites [Figure 1] or remote extraoral sites. 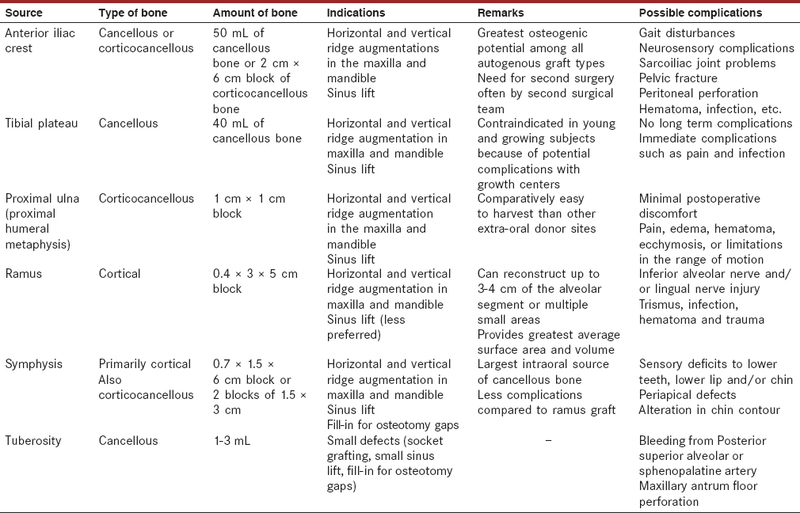 Usually, the intraoral sites, i.e., mandibular symphysis (chin), ramus, and tuberosity, etc., are preferred over distant extraoral sites, i.e., anterior iliac crest, tibial plateau, and proximal ulna [Table 3]. This is mainly owing to the ease of harvest and the low morbidity associated with intraoral grafts. On the other hand, extraoral graft may require a second surgery or even a second surgical team, which often extrapolates to increased cost and management in “in-patient settings.” Also, grafting from the extraoral donor site is associated with greater risk of complications and longer periods of postoperative management  [Table 3]. Autogenous grafts can be cortical, cancellous, or corticocancellous., The prime difference between cortical and cancellous (particulate) bone grafts is with respect to healing and the ability to be contoured and adapted to the recipient site., Cancellous grafts undergo rapid incorporation (within weeks to months) and have greater osteogenetic potential compared to cortical grafts., On the other hand, incorporation of cortical grafts is rather a slower process known as creeping substitution where the revascularization starts from periphery toward the center. In fact, the remnant pieces of donor graft may persist as necrotic areas walled off by new bone. It is easier to achieve primary stabilization with cortical grafts while cancellous grafts often require to be contained within membranes or titanium mesh due to the lack of rigidity. Mandibular nerve trunk anesthesia is supplemented with local infiltration in the area of coronoid process, mental foramen, and buccal part of the mandibular body reaching toward the mandibular base. Theincision extends from the medial aspect of the external oblique ridge to the first molar area. The concavity where the external oblique ridge meets the ramus is the prime landmark to facilitate locating the starting point of this incision. A mucoperiosteal flap is reflected to visualize the border between the external oblique ridge and ascending ramus. The lateral border of the ramus and the external oblique ridge is dissected free. The soft tissues are retracted along the anterior border of the ramus till the insertion fibers of the temporalis muscle are identified. The donor area is identified and the borders of the osteotomy cuts are marked by drilling holes through the cortex till the cancellous bone is identified by marrow bleeding. The superior border of osteotomy cut is made on external oblique ridge along the anterior border of the ramus approximately till one-third of the width of the ramus. The anterior cut is placed along the distal aspect of the first permanent molar. The inferior cut is placed approximately 4-5 mm superior to the mandibular canal. Medially, the osteotomy cut is placed in the lateral cortex. After delineating the margins of the osteotomy cuts by drilling holes, the cuts are completed with either rotary or osteotome or piezotome. The latter is considered to be the best owing to inherent low risks associated with its use while osteotome is least preferred due to poor patient acceptance. Following this, the lateral bone block is fractured with due care to avoid damage to the inferior alveolar neurovascular bundle. A collagen membrane is used the fill the donor area defect, which is closed by running sutures after hemostasis. The graft is stored in blood-soaked gauze till it is particulated or transplanted. Mandibular nerve block is supplemented with local infiltration in the anterior mandibular labial vestibule. The mucoperiosteal flap can be raised by vestibular or sulcular incision. The former is preferred as the latter is associated with postoperative gingival recession. The two-layer vestibular incision is made through the deepest part between the vestibule and lip. The lateral extent of the incision depends on the purpose of harvest. For local grafts, the incision is limited till the canines. On the other hand, for maxillary sinus grafting the incision in extended till the premolars to locate the mental nerves. The superior osteotomy cut is placed at least 5 mm inferior to the apex of the mandibular teeth and the inferior cut is placed approximately 4 mm superior to the inferior border of the mandible [Figure 3]. Often, the graft is given a cut in the midline and is harvested in two parts using an osteotome. As described for ramus graft, the residual symphyseal cavity is packed with collagen membrane after achieving hemostasis. The closure is performed in two layers, i.e., periosteum and muscle layer followed by mucosa. The graft is handled in same way as described for ramus graft. Posterior superior alveolar nerve block. The mid-crestal incision extending from the hamular notch to the second molar area is employed to gain access to maxillary tuberosity. Only a little amount of bone (1-3 mL) is removed using a rongeur or piezotome. The latter is again a preferred approach owing to lesser risks. For maxillary tuberosity, primary closure can be achieved due to small residual defect. The graft should be harvested keeping a minimum of 2 mm clearance from the maxillary sinus. In case of oroantral communication, the closure can be achieved using either of the buccal sliding flap, buccal fat pad, or palatal finger flap. The grafts are harvested from the same species but from a different donor (genetically heterogeneous). These can be fresh-frozen, freeze-dried bone allografts (FDBAs) or demineralized freeze-dried bone allografts (DFDBAs)., FDBA and DFDBA are preferred over fresh-frozen allografts in the wake of their low immunogenicity. Essentially, allografts are osteoconductive with the exception being DFDBA, which may possess some osteoinductive potential. This is possibly because of the exposed organic content (might be growth factors) after demineralization. The mechanism of incorporation of allografts involves creeping substitution similar to autogenous cortical grafts. FDBA undergoes faster replacement and osseointegration compared to DFDBA and thus enables earlier implant placement. Whenever it is osseointegration is desired to be delayed as in cases of poor confines, i.e., sinus augmentation, DFDBA is preferred over FDBA. These grafts are derived from genetically dissimilar species, i.e., bovine, porcine, equine, and coralline, etc.,, The bovine grafts are preferred over other sources of xenografts. Mainly, inorganic portion of the bone is used. Commercially, these grafts are available in block or particulate form. 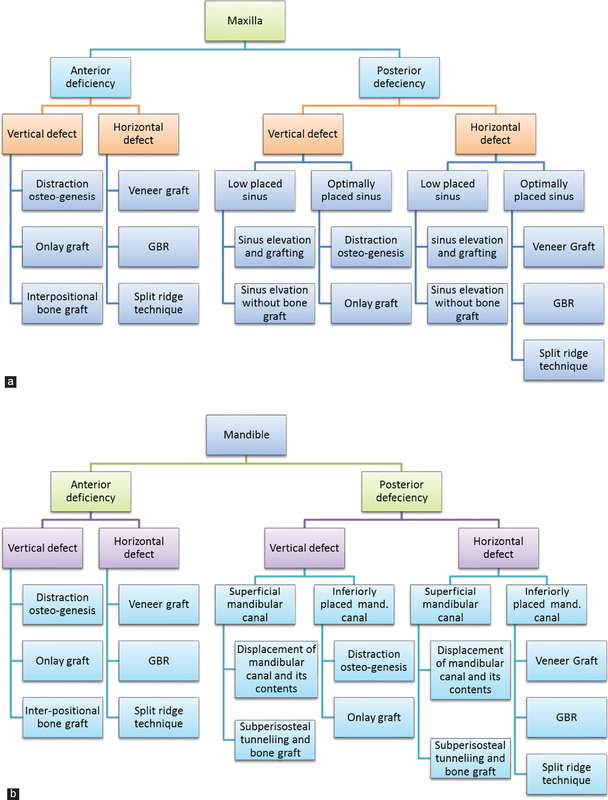 Unfortunately, high failure rates (higher rates of connective tissue ingrowth, poor vascularization, delayed osseointegration) are associated with these grafts. These are synthetic grafts of nonbiologic origin available in a range of porosities and densities, i.e., hydroxyapatite, calcium sulfate, tricalcium phosphate, and bioactive glass. For clear reasons, these are osteoconductive. When used alone, these types of materials often yield suboptimal bone turnover and this fact limits their use. However, these can be combined with autogenous grafts in various proportions to yield optimal results. 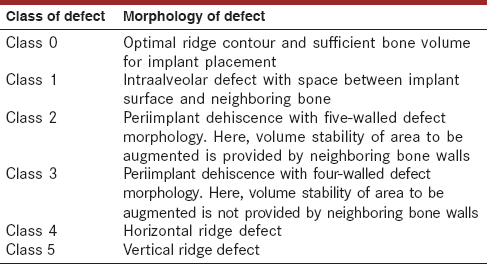 The suitable technique and material for ridge augmentation is dependent on clinical characteristics of the patients, i.e., location and type of defect and the surgeon's own preference. Latter is often affected by surgeon's clinical skill and expertise, and financial aspects but mostly it is dictated by principles laid by evidence. Here, in this section simplified evidence-based decision pathways for the selection of suitable techniques for socket preservation and ridge grafting are presented [Figure 4] and [Figure 5]. The foremost step in treatment planning, i.e., selection of the right technique as well biomaterial and timing of augmentation (staged versus simultaneous) is preoperative patient assessment. These preoperative considerations include systemic health status and local factors, i.e., morphology of soft tissues and bone. Although it is advisable to employ cone beam computed tomography to scan the defect in three dimensions, panoramic radiographs in combination with suitable intraoral radiographs may also be used. It is essential to have sufficient soft tissue coverage to ensure primary tension-free closure over the planed area of augmentation. In cases of probable inadequacy of soft tissues, the augmentation of soft tissues must be planned prior to augmenting hard tissues. Assessment of bone morphology at the planned site of implant placement include adequacy of bone volume, ridge contour, and position of marginal bone of neighboring teeth. The alveolar bone uneventfully resorbs after extraction and results in residual ridge morphology with compromised horizontal and vertical bone volume to receive implant and a lingually positioned crest due to greater resorption on the buccal aspect.,, Socket grafting at the time of extraction is a preventive procedure, which does not inhibit the resorption but limits it. Moreover, the minimal amount of resorption after socket grafting happens in a predictable fashion. Also, the magnitude of volume loss is less in the grafted socket versus the naive socket. This has been substantiated by a recent meta-analysis where ≈1.4 mm lesser horizontal bone loss and ≈1.8 mm lesser vertical bone loss were reported in grafted sites compared to nongrafted sites. However, it is interesting to note that similar mean implant survival rates has been reported for implants placed in preserved sites versus naive sites. Additionally, the bone grafting may still be needed at the time of implant placement as it is only possible to limit the alveolar bone resorption and yet not possible to completely eliminate it. These facts question the rationale of socket preservation. In the light of these facts, it is recommended that it should be performed in aesthetic areas in case of buccal bone thickness≤2 mm or when there is a proximity to anatomic structures, i.e., maxillary sinus or mandibular canal. Also, overaugmentation may help, especially in aesthetically sensitive areas where the buccal bone contour is critical. There is a lack of evidence regarding the choice of techniques and biomaterials for socket preservation. Benic and Hämmerle (2014) beautifully described the grafting protocol on the basis of class defect. The authors described six phenotypes on the basis of morphology of defects [Table 4] and [Figure 6] and they also provided guidance on choice of biomaterial and technique for socket preservation [Figure 6]. 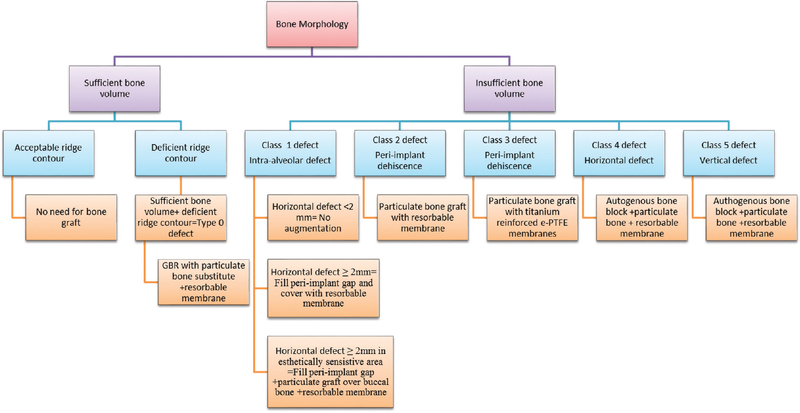 Figure 6: classification of bone defects. Onlay grafting can either be block onlay grafting or particulate onlay grafting. The latter can further be categorized as subperiosteal tunnel grafting or direct particulate onlay grafting. 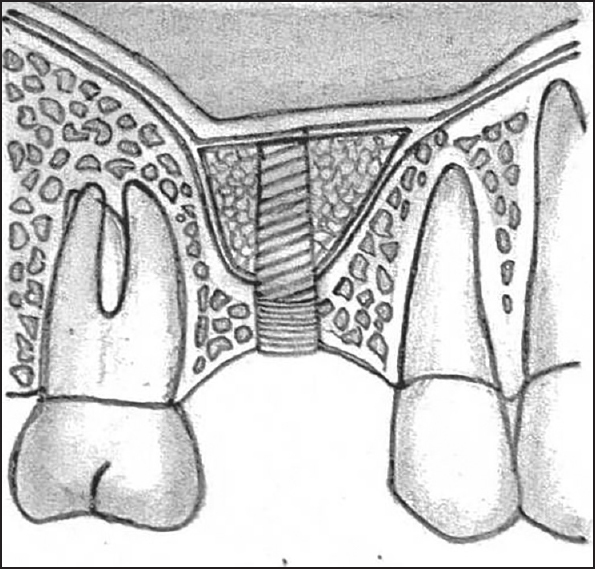 Indications: The direct particulate onlay grafting [Figure 7] is employed for correcting horizontal deficiencies in the anterior maxilla and for saddle depressions, i.e., vertical deficiency. The recipient sites with three-walled and four-walled defect morphology with an apical stop are considered to be best amenable to direct particulate onlay grafting. Technique: The direct particulate onlay grafting can be performed as a staged or simultaneous procedure. The planned recipient area is exposed by raising a mucoperiosteal flap to visualize the defect. It is important to place releasing incisions to ensure direct visualization of the defect and tension-free closure. After drilling holes in the recipient bed to ensure osseointegration, the particulate graft is condensed over the defect. For defects with poorly contained boundaries, (i.e., maxillary sinus) demineralized grafts are preferred over mineralized grafts due to their slower resorption. The coverage with membranes is often recommended but can be omitted for small defects with sufficient neighboring walls to provide volume stability., The malleability and workability of particulate graft can be enhanced with tissue adhesives, i.e., fibrin sealants or protein-based regenerative gels (Emdogain; Straumann, Andover, MA, USA). 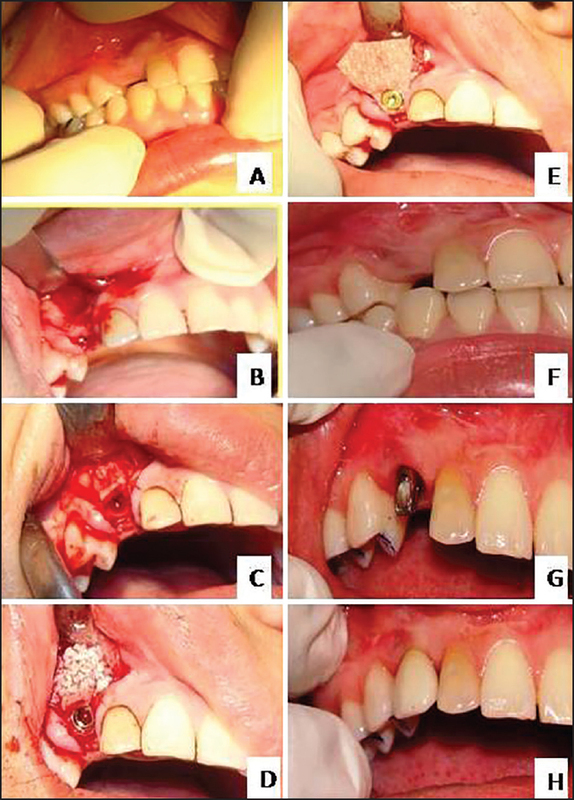 Small to moderate buccal plate defects are best open to subperiosteal tunnel grafting. The morphology of such defects is characterized by wider buccal base with narrow crestal width (≤4 mm) and intact lingual wall with optimum vertical dimensions. After administration of local anesthesia, access incision is placed distant (often mesially) from the recipient site. Subperiosteal tunneling from the incision to graft site is performed with the help of a periosteal elevator. The demineralized particulate bone graft is placed in this subperiosteal tunnel with the help of modified 1 mL carrier syringe. The graft may need digital manipulation to conform to the recipient bed in the desired form. The mesial incision is closed in a tension-free manner to ensure uneventful healing with minimal risks of dehiscence and graft exposure. Horizontal or vertical deficiency or combined horizontal and vertical deficiency. Vertical deficiency with preexisting minimal vertical alveolar dimensions of 4-5 mm and without any soft tissue deficit. A vestibular incision is placed in nonkeratinized mucosa to expose the facial aspect of the planned area of augmentation. First, vertical corticotomies and osteotomies are performed using micro reciprocating and sees to the preservation of ≈2 mm of bone around the roots of neighboring teeth. This is followed by horizontal corticotomy and osteotomy to mobilize the segment. A minimum clearance of ≈3-5 mm from vital structures such as the maxillary sinus or mandibular canal is essential. It is crucial to perform only as much advancement as permitted by the soft tissue envelope to achieve tension-free closure. The free segment can also be advanced buccally or lingually to achieve the desired prosthodontic position. 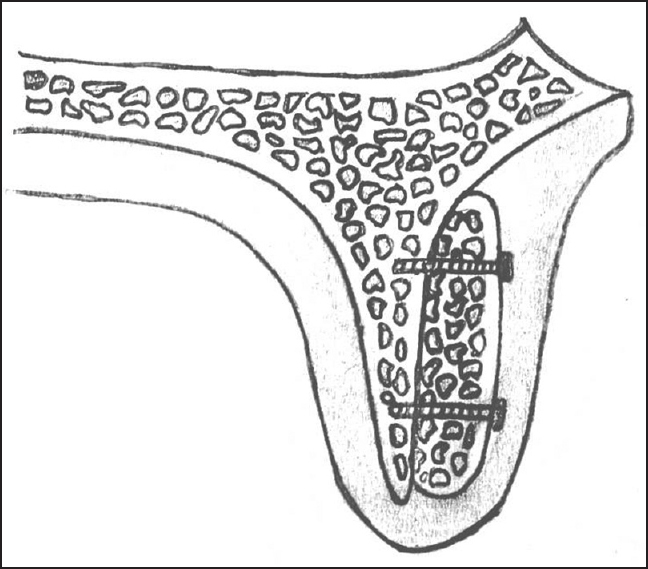 After careful transportation preserving soft tissue attachments, the bone graft block (usually corticocancellous autogenous graft) is sandwiched between the transported segment and basal bone [Figure 11] and [Figure 12]. 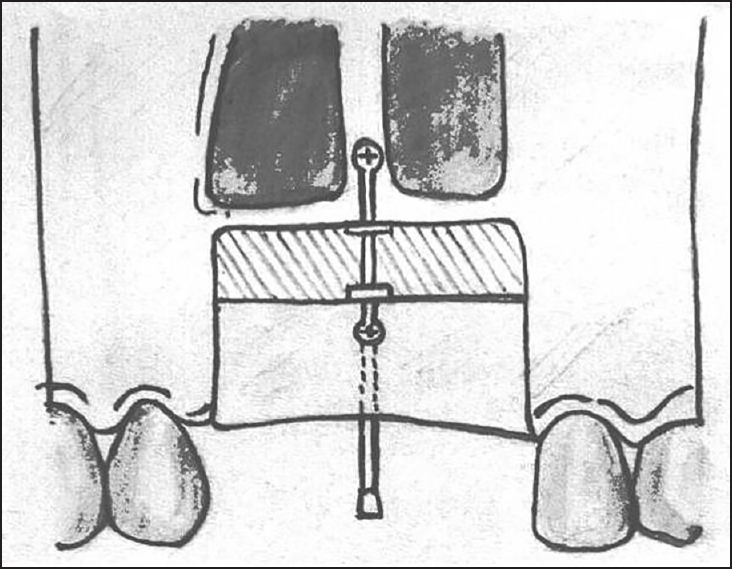 The graft fixation is achieved with miniplates. Periosteal releasing incisions may be placed to aid tension free closure. This technique can be utilized in case of alveolar width ≥4 mm so that a minimum of 2 mm thickness of outfractured buccal and lingual walls can be achieved., This is essential for maintaining the vascularity of the outfractured segments. The mucoperiosteal flap to expose the donor area is raised by a crestal incision. A vertical osteotomy ≈10-12 mm in length is performed on the recipient alveolar crest with a clearance of 2 mm from the roots of adjacent teeth. After osteotomy is complete, the facial and lingual walls are spread apart by using osteotomes to make space for placement of the implant [Figure 13]. Residual voids are filled with particulate graft and the implant is submerged at least 1 mm apical to the alveolar ridge crest [Figure 14]. The closure must be tension-free and in case of soft tissue deficit, collagen membrane with soft tissue graft can be used to close the defect. The technique described above is conventional ridge split technique where immediate implant placement is performed. It can be performed when horizontal deficiency exists at the crestal part and the ridge widens apically. However, it is not uncommon to encounter challenging ridge morphology, i.e., deficient ridge crest combined with severe facial concavity. This may exist in case of chronic periapical infection where longstanding inflammation caused resorption of the labial cortical plate in the apical region. In such a condition, ridge-splitting may lead to sudden fracture of the cortical plate at the apical region. Fortunately, with a little modification, the ridge split technique is still feasible. The flap is raised only in the crestal part to be expanded and the dehiscence in the apical area is left undisturbed. The crestal part is expanded and particulate graft is packed over facial dehiscence by the subperiosteal tunnel technique. The advantages of this technique include being less invasive and abolishing the need for placement of the barrier membrane. The best suited histological bone type amenable to ridge-splitting and expansion is bone with medium density (maxillary bone), i.e., porous cortical bone with coarse/fine trabecular bone (D3/D4 bone). It is tricky to perform ridge-splitting in case of dense cortical bone, i.e., the mandible where sudden fracture of cortical plates may happen during expansion. In mandibular ridge with dense cortical plates, ridge-splitting can be performed using either two-stage or one-stage approach. The choice between the two depends on the availability of armamentarium and surgeons' skill. The one-stage conventional approach is preferred only when the surgeon has adequate experience supported with suitable armamentarium, e.g., piezosurgery. Only modification here in one stage ridge-splitting for mandibular ridge compared to conventional ridge split is raising flap from either buccal or facial side compared to both sides in conventional technique. Here, the intact mucoperiosteal flap protects in case of sudden fracture of the cortical plate. In two-stage approach of ridge-splitting, an osteotomy is performed similar to the conventional ridge split procedure. But expansion is not performed at this stage; rather the flap is sutured back. After a healing period of 3-4 weeks, the osteotomy area is accessed again. The new bone formed at the osteotomy site during this healing period is soft and expandable. 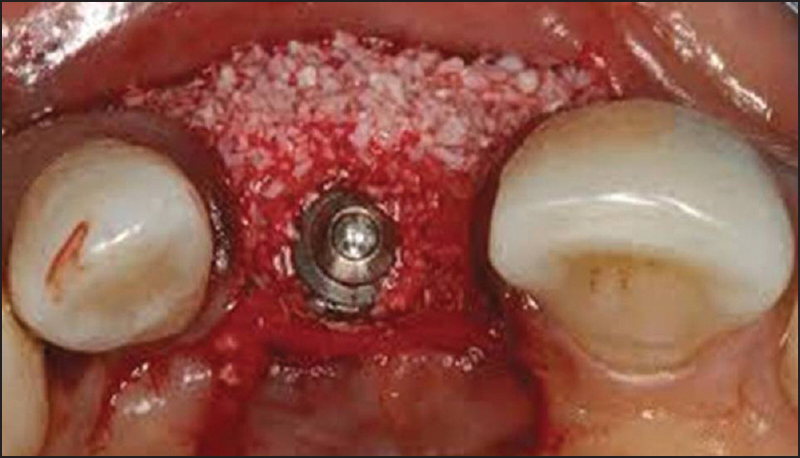 Thus, ridge-splitting and implant placement at reentry after 3-4 weeks becomes easier. Due care is taken to raise the flaps only minimally. The periimplant spaces are filled with particulate graft and the lingual flap is coronally advanced and sutured back. Uncovering of implants and functional loading is done after 4-6 months. ≤6 mm width of the alveolar ridge crest. The alveolar ridge crest is exposed by raising a mucoperiosteal flap. Horizontal osteotomy is performed extending from 1 mm distance from neighboring tooth to 8-10 mm distal to the axis of the last implant. The horizontal osteotomy is extended as deep as the length of the implants to be placed. Following this releasing, vertical osteotomy is performed. This is essential in case of dense cortical bone. The vertical osteotomy cuts are placed at the mesial and distal ends of the horizontal osteotomy cut. With a pilot drill, osteotomy holes (1.2-2 mm) corresponding to each implant site are placed. Then immediately expansion screws are placed. The maximum diameter of these screws is 2.5 mm and ≈1 mm expansion of the buccal cortical plate is achieved. Next, differential preparation of the implant site is done by reducing the width of the lingual and sometimes buccal cortical plate to reduce the need of expansion. This is possible if width of the alveolar crest is ≈4-5 mm. Second, expansion screws of 3.5 mm diameter are inserted in differentially prepared pilot osteotomy sites to enable additional expansion by 0.5 mm. Lastly, implants corresponding to 4 mm diameter are placed. This results in an additional expansion of 0.5 mm and a net total expansion of 2 mm. The final outcome is net total alveolar crest width of 6 mm with 1 mm thickness of the buccal as well as lingual cortical plate. 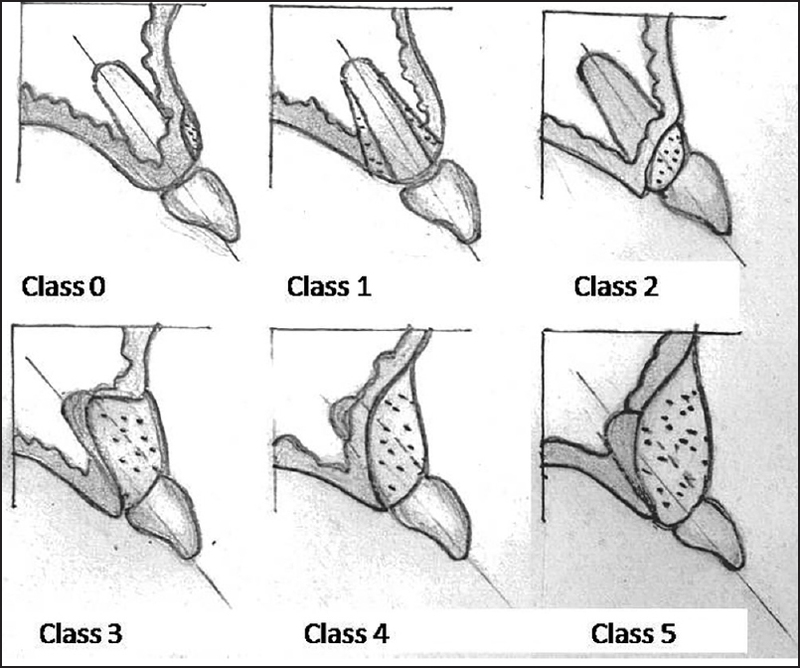 This technique allows significant augmentation of both hard and soft tissues in areas with extensive tissue loss in a staged manner.,,, A transport segment is mobilized in a similar manner as for interpositional bone grafting, preserving attachment to the crestal and lingual tissues [Figure 17]. The transport segment can be mobilized in multiple planes to allow simultaneous correction of buccolingual postions as well. The distractor is fixed to transported and basal bone segments with approximately 1-2 mm gap between the two segments. This is left in situ for a latency period of 5-7 days to allow the formation of soft tissue callus between the two segments and then activation is started at the rate of 0.5-2 mm/day for periodic distraction. After completion of the desired amount of distraction, the distraction device is removed and quality of the bone is explored. The newly formed bone is hourglass shaped and placement of additional grafts may be required for proper implant placement at this time. The implant placement is performed after a period of 4-6 months. Lateral wall of the maxillary sinus is exposed by raising a trapezoidal flap with anterior releasing incision adjacent to the last tooth and posterior releasing incision in the posterior part of the infrazygomatic crest. A midcrestal incision is placed and mucoperiosteal flap is reflected. A bone window approximately 15 mm × 10 mm in size is created at least 5 mm superior to the sinus floor. A small round bur is used to outline the margins of the window by placing holes in the bone with due care to leave the underlying membrane intact. The holes are connected and the window is created by infracture of the outlined bone. The membrane is dissected free from the bone, i.e., anterior wall and floor of the sinus. 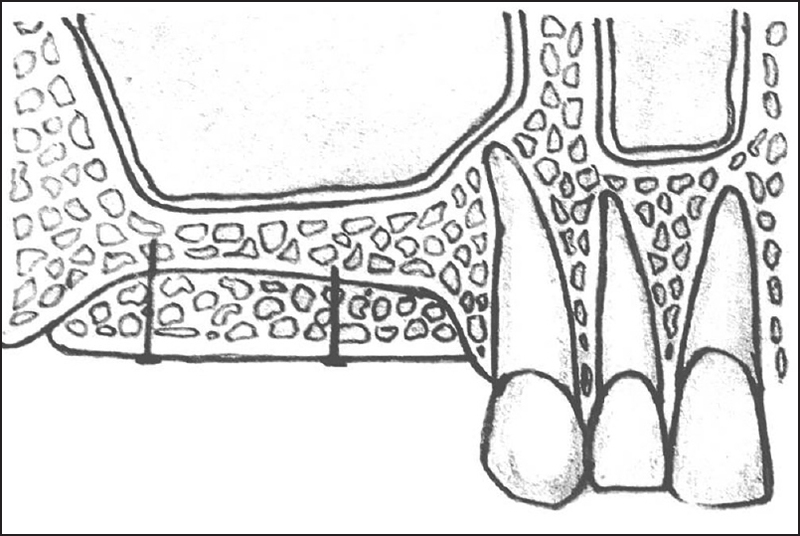 After dissection and ensuring intactness of the mucosa, it is lifted and bone graft in particulate form is condensed to fill the created cavity, which is then closed by replacing the oral mucosa [Figure 18]. Postoperative care includes refraining from sneezing and blowing of the nose and decongestants and antibiotic coverage. A modification of this technique involves filling the cavity with blood instead of graft material. The implant is placed traversing through the created cavity with the membrane resting on its top. A consolidation period of 3-4 months is recommended. This technique is based on the principle of creating a barrier to the ingrowth of connective tissue and epithelial cells and space maintenance for osteogenesis. GBR, also known as guided tissue regeneration, is an evidence-based predictable approach for separating the bone graft material (usually particulate) from neighboring soft tissues to allow unimpeded bone formation. 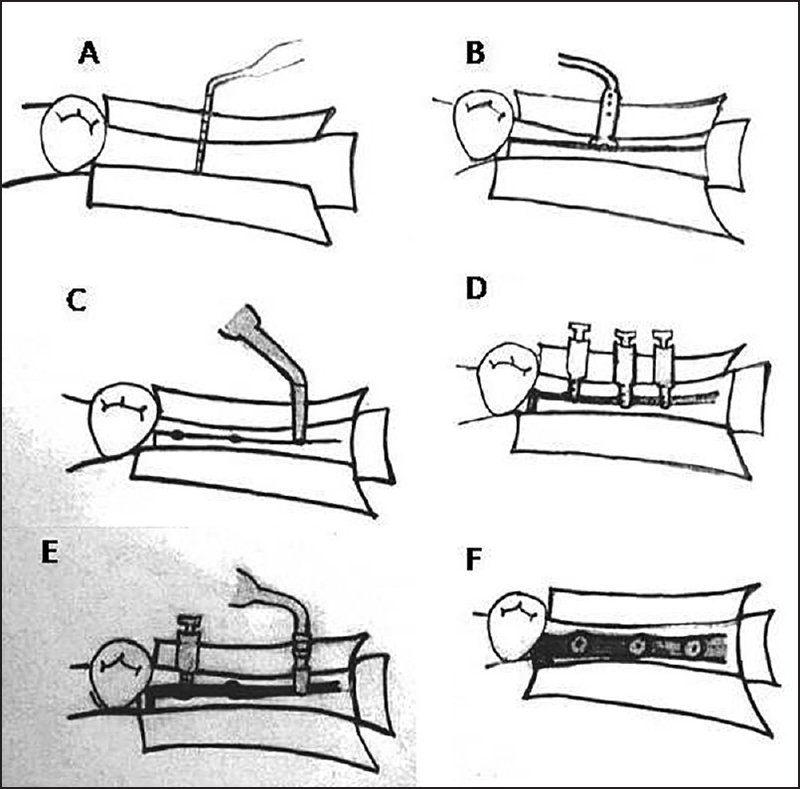 In this technique, a membrane is secured covering the graft material to stabilize the material, parting it from adjacent connective tissues, and limiting resorption [Figure 19] and [Figure 20]. 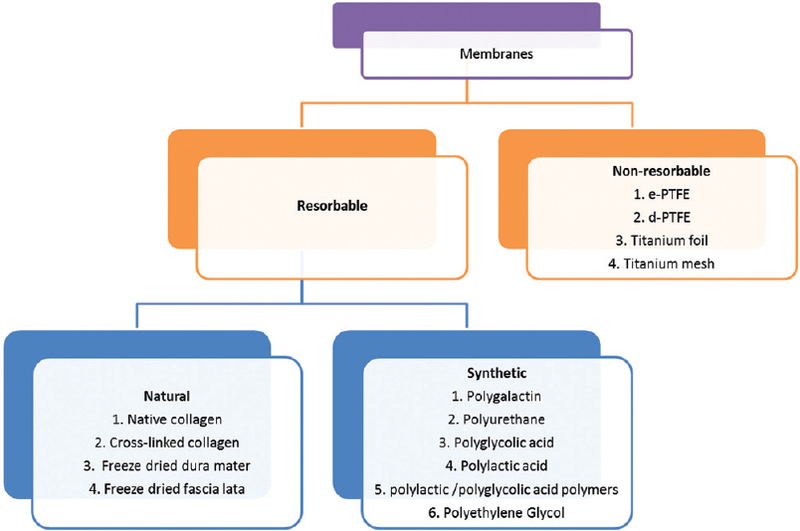 A plethora of membranes, resorbable/nonresorbable and moldable or stiff are available [Figure 21]. The choice of membrane mainly depends on volume stability of the graft in defect. Stiff membranes such as titanium mesh or metal supported expanded polytetrafluoroethylene (e-PTFE) are suitable for complex defects, i.e., vertical defects. For small to moderate defects, resorbable collagen membrane or platelet-rich fibrin (PRF) membranes [Figure 22] are preferred. Nonresorbable membranes such as Ti-mesh and e-PTFE have an inherent problem of requiring second surgery to remove them. Further, with Ti-mesh there is a risk of fibrous ingrowth and exposure of membrane through the gingiva. To limit this unwanted outcome, use of collagen membrane to cover Ti-mesh as an adjuvant barrier is recommended. Another problem associated with membranes is premature exposure of membrane resulting in infection and exposure of graft. This is observed more commonly with alloplastic membranes, which are occlusive and may interfere with blood supply. Although mainly used in conjunction with particulate graft, the barrier technique may also be used for block graft. In this paper, a simplified algorithm has been presented to serve as a clinical guide for decision-making in ridge augmentation as well as socket preservation. As the evidence suggests, GBR is the most predictable technique. The continued thrust of active research in this area may result in development of more simplified and promiscuous methods of regeneration. The authors are thankful to Dr. Anuj Aggarwal (former postgraduate student, Department of Oral and Maxillofacial Surgery, Santosh Dental College and Hospital, Ghaziabad, Uttar Pradesh, India) for contributing a few of the clinical photographs. Parker C. The Growth of Implant Dentistry. The Dentist. Surrey, United Kingdom: George Warman Publications; 2012. Quirynen M, Herrera D, Teughels W, Sanz M. Implant therapy: 40 years of experience. Periodontol 2000 2014;66:7-12. Buser D, Martin W, Belser UC. Optimizing esthetics for implant restorations in the anterior maxilla: Anatomic and surgical considerations. Int J Oral Maxillofac Implants 2004;19(Suppl):43-61. Grunder U, Gracis S, Capelli M. Influence of the 3-D bone-to-implant relationship on esthetics. Int J Periodontics Restorative Dent 2005;25:113-9. Araújo MG, Lindhe J. Dimensional ridge alterations following tooth extraction. An experimental study in the dog. J Clin Periodontol 2005;32:212-8. Tan WL, Wong TL, Wong MC, Lang NP. A systematic review of post-extractional alveolar hard and soft tissue dimensional changes in humans. Clin Oral Implants Res 2012;23(Suppl 5):1-21. Masaki C, Nakamoto T, Mukaibo T, Kondo Y, Hosokawa R. Strategies for alveolar ridge reconstruction and preservation for implant therapy. J Prosthodont Res 2015;59:220-8. Haggerty CJ, Vogel CT, Fisher GR. Simple bone augmentation for alveolar ridge defects. Oral Maxillofacial Surg Clin North Am 2015;27:203-26. 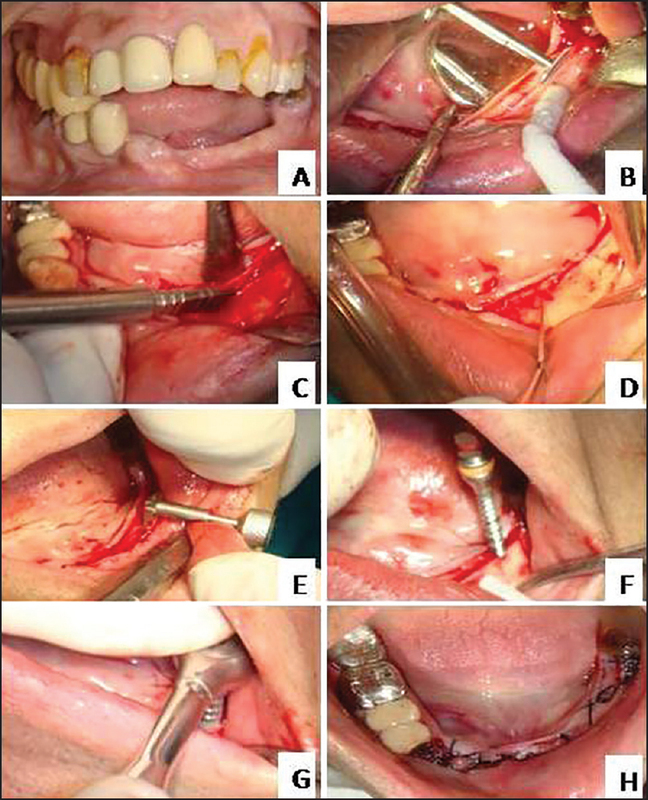 Herford SA, Nguyen K. Complex bone augmentation in alveolar ridge defects. Oral Maxillofacial Surg Clin North Am 2015;27:227-44. Blanco J, Nuñez V, Aracil L, Muñoz F, Ramos I. Ridge alterations following immediate implant placement in the dog: Flap versus flapless surgery. J Clin Periodontol 2008;35:640-8. Araújo MG, Lindhe J. Ridge alterations following tooth extraction with and without flap elevation: An experimental study in the dog. Clin Oral Implants Res 2009;20:545-9. Saldanha JB, Casati MZ, Neto FH, Sallum EA, Nociti FH Jr. Smoking may affect the alveolar process dimensions and radiographic bone density in maxillary extraction sites: A prospective study in humans. J Oral Maxillofac Surg 2006;64:1359-65. Moya-Villaescusa MJ, Sánchez-Pérez A. Measurement of ridge alterations following tooth removal: A radiographic study in humans. Clin Oral Implants Res 2010;21:237-42. Carlsson GE, Persson G. Morphologic changes of the mandible after extraction and wearing of dentures. A longitudinal, clinical, and x-ray cephalometric study covering 5 years. Odontol Revy 1967;18:27-54. Chappuis V, Engel O, Reyes M, Shahim K, Nolte LP, Buser D. Ridge alterations post-extraction in the esthetic zone: A 3D analysis with CBCT. J Dent Res 2013;92(Suppl):195-201S. Avila-Ortiz G, Elangovan S, Kramer KW, Blanchette D, Dawson DV. Effect of alveolar ridge preservation after tooth extraction: A systematic review and meta-analysis. J Dent Res 2014;93:950-8. Horváth A, Mardas N, Mezzomo LA, Needleman IG, Donos N. Alveolar ridge preservation. A systematic review. Clin Oral Investig 2013;17:341-63. Rasia-dal Polo M, Poli PP, Rancitelli D, Beretta M, Maiorana C. Alveolar ridge reconstruction with titanium meshes: A systematic review of the literature. Med Oral Patol Oral Cir Bucal 2014; 19:e639-46. Ricci L, Perrotti V, Ravera L, Scarano A, Piattelli A, Iezzi G. Rehabilitation of deficient alveolar ridges using titanium grids before and simultaneously with implant placement: A systematic review. J Periodontol 2013;84:1234-42. Esposito M, Grusovin MG, Rees J, Karasoulos D, Felice P, Alissa R, et al. Interventions for replacing missing teeth: Augmentation procedures of the maxillary sinus. Cochrane Database Syst Rev 2010;CD008397. Vignoletti F, Matesanz P, Rodrigo D, Figuero E, Martin C, Sanz M. Surgical protocols for ridge preservation after tooth extraction. A systematic review. Clin Oral Implants Res 2012; 23(Suppl 5):22-38. Al-Nawas B, Schiegnitz E. Augmentation procedures using bone substitute materials or autogenous bone — A systematic review and meta-analysis. Eur J Oral Implantol 2014;7(Suppl 2):S219-34. Carini F, Longoni S, Amosso E, Paleari J, Carini S, Porcaro G. Bone augmentation with TiMesh. Autologous bone versus autologous bone and bone substitutes. A systematic review. Ann Stomatol (Roma) 2014;5(Suppl 2):27-36. Milinkovic I, Cordaro L. Are there specific indications for the different alveolar bone augmentation procedures for implant placement? A systematic review. Int J Oral Maxillofac Surg 2014;43:606-25. Esposito M, Grusovin MG, Felice P, Karatzopoulos G, Worthington HV, Coulthard P. The efficacy of horizontal and vertical bone augmentation procedures for dental implants — A Cochrane systematic review. Eur J Oral Implantol 2009;2:167-84. Arora NS, Ramanayake T, Ren YF, Romanos GE. Platelet-rich plasma in sinus augmentation procedures: A systematic literature review: Part II. Implant Dent 2010;19:145-57. Annibali S, Cristalli MP, Dell'aquila D, Bignozzi I, La Monaca G, Piloni A. Short dental implants: A systematic review. J Dent Res 2012;91:25-32. Lee SA, Lee CT, Fu MM, Elmisalati W, Chuang SK. Systematic review and meta-analysis of randomized controlled trials for the management of limited vertical height in the posterior region: Short implants (5 to 8 mm) vs longer implants (>8 mm) in vertically augmented sites. Int J Oral Maxillofac Implants 2014; 29:1085-97. Klijn RJ, Meijer GJ, Bronkhorst EM, Jansen JA. Sinus floor augmentation surgery using autologous bone grafts from various donor sites: A meta-analysis of the total bone volume. Tissue Eng Part B Rev 2010;16:295-303. Waasdorp J, Reynolds MA. Allogeneic bone onlay grafts for alveolar ridge augmentation: A systematic review. Int J Oral Maxillofac Implants 2010;25:525-31. Del Fabbro M, Corbella S, Weinstein T, Ceresoli V, Taschieri S. Implant survival rates after osteotome-mediated maxillary sinus augmentation: A systematic review. Clin Implant Dent Relat Res 2012;14(Suppl 1):e159-68. Jamjoom A, Cohen RE. Grafts for ridge preservation. J Funct Biomater2015;6:833-48. Khan SN, Cammisa FP Jr, Sandhu HS, Diwan AD, Girardi FP, Lane JM. The biology of bone grafting. J Am Acad Orthop Surg 2005;13:77-86. Stern A, Barzani G. Autogenous bone harvest for implant reconstruction. Dent Clin North Am 2015;59:409-20. Benic GI, Hämmerle CH. 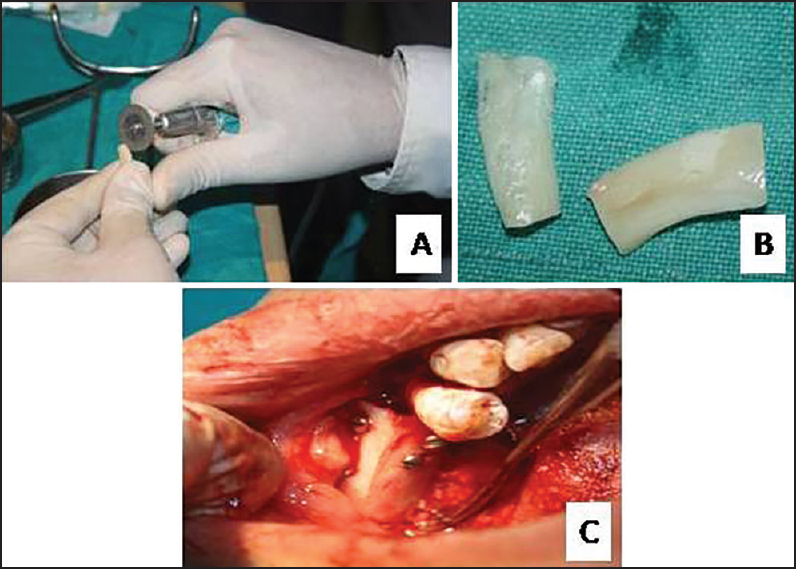 Horizontal bone augmentation by means of guided bone regeneration. Periodontol 2000 2014;66:13-40. Scardina GA, Carini F, Noto F, Messina P. Microcirculation in the healing of surgical wounds in the oral cavity. Int J Oral Maxillofac Surg 2013;42:31-5. LaTrenta GS, McCarthy JG, Breitbart AS, May M, Sissons HA. 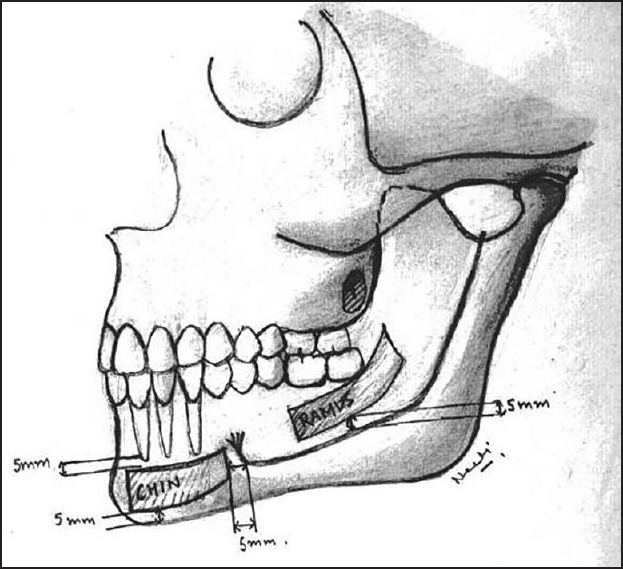 The role of rigid skeletal fixation in bone-graft augmentation of the craniofacial skeleton. Plast Reconstr Surg 1989;84:578-88. Bowler D, Dym H. Bone morphogenic protein: Application in implant dentistry. Dent Clin N Am 2015;59:493-503. Boyne PJ, Lilly LC, Marx RE, Moy PK, Nevins M, Spagnoli DB, et al. De novo bone induction by recombinant human bone morphogenetic protien-2 (rhBMP-2) in maxillary sinus floor augmentation. J Oral Maxillofac Surg 2005;63:1693-707. Fiorellini JP, Howell TH, Cochran D, Malmquist J, Lilly LC, Spagnoli D, et al. Randomized study evaluating recombinant bone morphogenetic protein-2 for extraction socket augmentation. J Periodontol 2005;76:605-13. Food and Drug Administration. Summary of Safety and Effectiveness Data (SSED) for P000058 Medtronic's InFUSE ™ Bone Graft/LT-CAGE Lumbar Tapered Fusion Device. Orthopaedic and Rehabilitation Devices Advisory Panel. 2002. Available from: http://www.accessdata.fda.gov/cdrh_docs/pdf/P000058b.pdf. [Last accessed on 2015 Oct 06]. Rubin CT, Lanyon LE. Regulation of bone formation by applied dynamic loads. J Bone Joint Surg Am 1984;66:397-402. Hämmerle CH, Karring T. Guided bone regeneration at oral implant sites. Periodontol 2000 1998;17:151-75. Singh AV, Shimada J. Block grafting for dental implants. In: Singh AV, Shimada J, editors. Clinical Implantology. 1st ed. India: Elsevier; 2013. p. 349-80. Bell RB, Blakey GH, White RP, Hillebrand DG, Molina A. 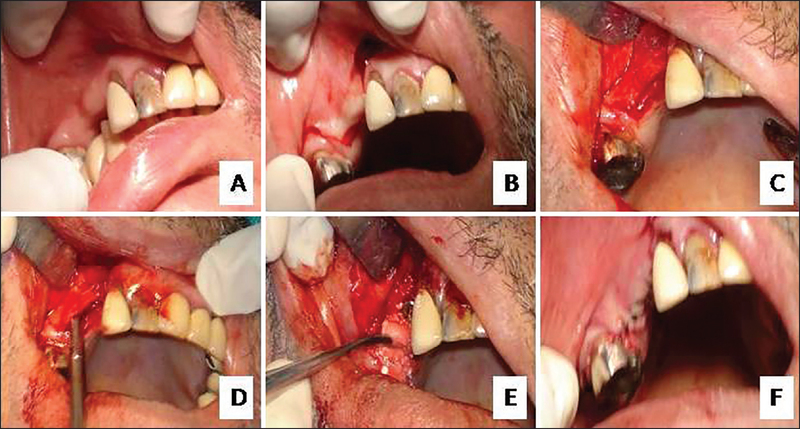 Staged reconstruction of the severely atrophic mandible with autogenous bone graft and endosteal implants. J Oral Maxillofac Surg 2002;60:1135-41. [Figure 15]: (Adopted) Vercellotti T. Ridge Expansion technique. In: Vercellotti T, editor. Essentials in Piezosurgery. 1st ed. Italy: Quintessence Publishing; 2009. p. 75-7. Herford AS. Distraction osteogenesis: A surgical option for restoring missing tissue in the anterior esthetic zone. J Calif Dent Assoc 2005;33:889-95. Elo JA, Herford AS, Boyne PJ. Implant success in distracted bone versus autogenous gone-grafted sites. J Oral Implantol 2009;35:181-4. 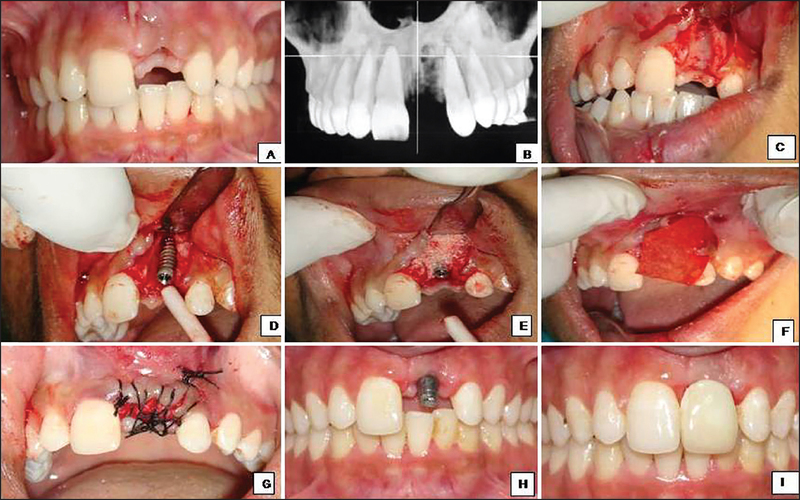 Herford AS, Tandon R, Stevens TW, Stoffella E, Cicciu M. Immediate distraction osteogenesis: The sandwich technique in combination with rhBMP-2 for anterior maxillary and mandibular defects. J Craniofac Surg 2013;24:1383-7. Bovi M. Mobilization of the inferior alveolar nerve with simultaneous implant insertion: A new technique. Case report. Int J Periodontics Restorative Dent 2005;25:375-83. Kan JY, Lozada JL, Goodacre CJ, Davis WH, Hanisch O. Endosseous implant placement in conjunction with inferior alveolar nerve transposition: An evaluation of neurosensory disturbance. Int J Oral Maxillofac Implants 1997;12:463-71. Proussaefs P. Vertical alveolar ridge augmentation prior to inferior alveolar nerve repositioning: A patient report. Int J Oral Maxillofac Implants 2005;20:296-301. Mohan N, Wolf J, Dym H. Maxillary sinus augmentation. Dent Clin North Am 2015;59:375-88. Boyne PJ. Augmentation of the posterior maxilla by way of sinus grafting procedures: Recent research and clinical observations. Oral Maxillofac Surg Clin North Am 2004;16:19-31, v-vi.